No more bulky plastic shells to protect your GoPro Hero under water. Hero 5 Black is a waterproof action camera down to 10 metres depth. One of the really cool features is the ability to control the camera using voice commands. For example, you can start and stop the camera using your voice. Tagging the photo or recording using a simple voice command is also possible. 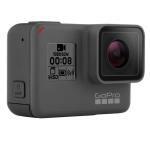 GoPro Hero 5 Black records in 4K format at 30 fps.